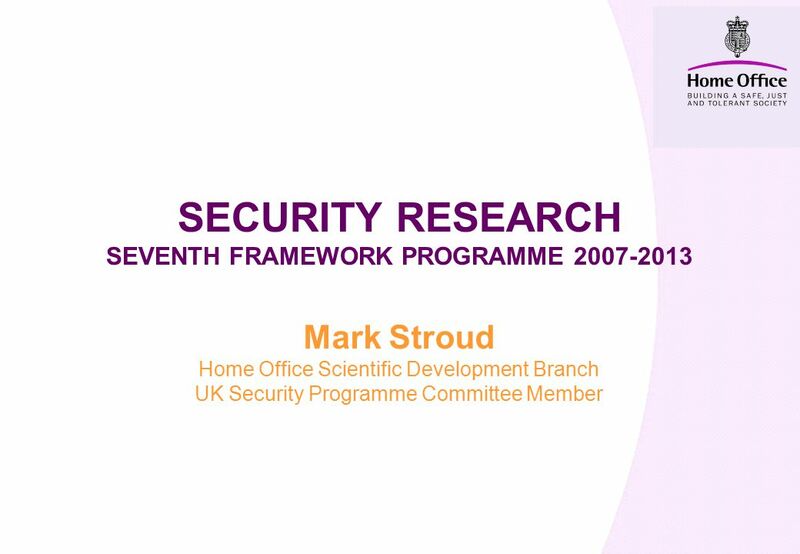 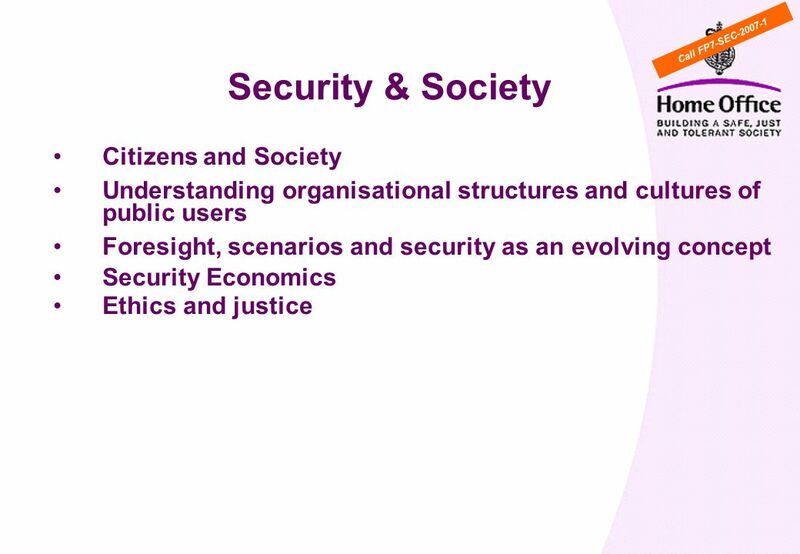 SECURITY RESEARCH SEVENTH FRAMEWORK PROGRAMME 2007-2013 Mark Stroud Home Office Scientific Development Branch UK Security Programme Committee Member. 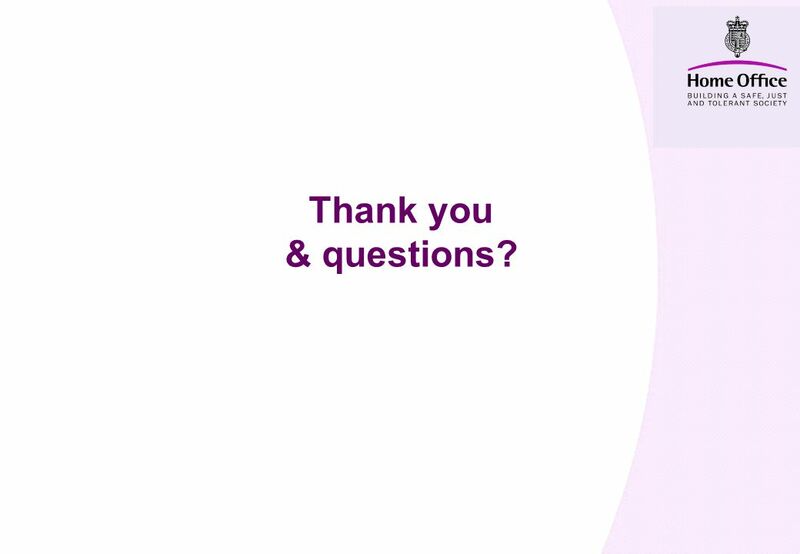 15 Thank you & questions? 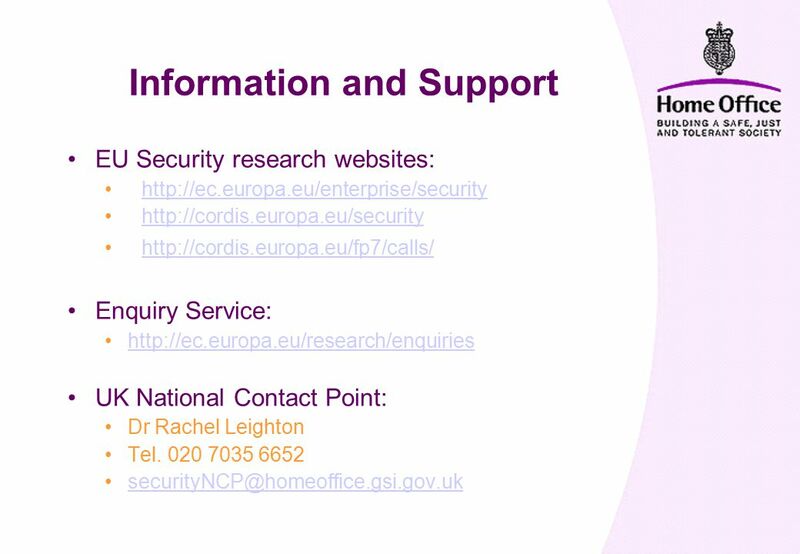 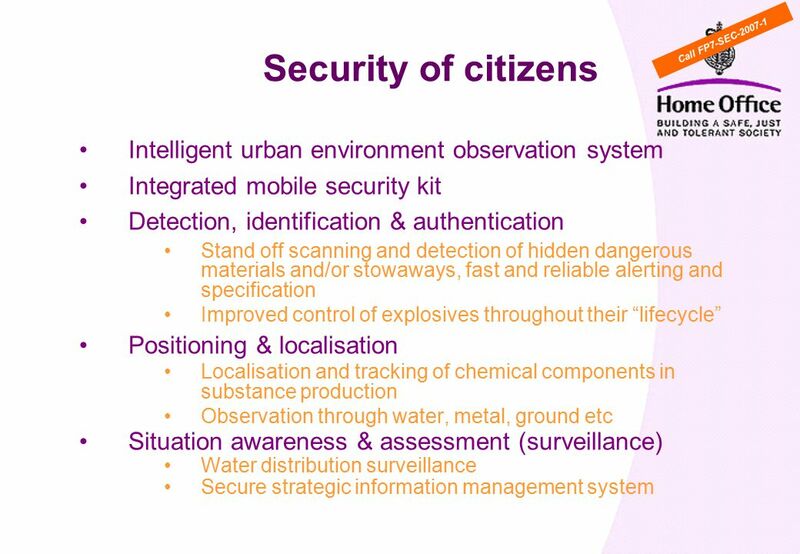 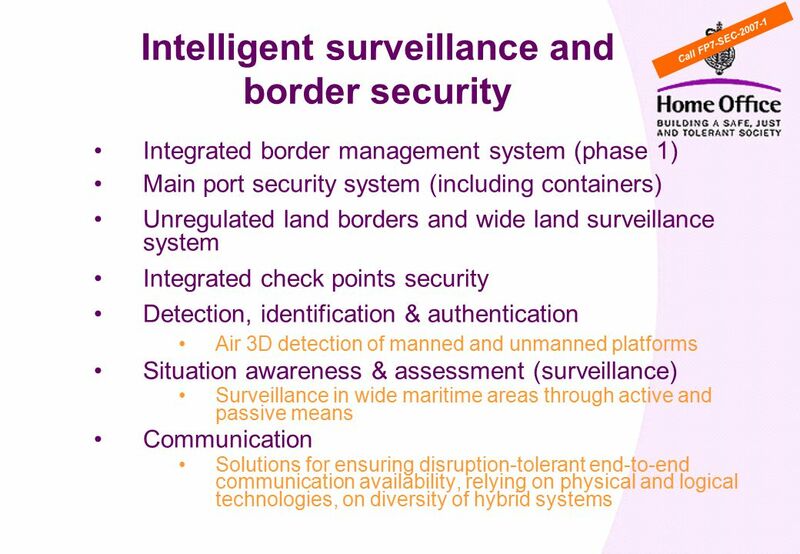 Download ppt "SECURITY RESEARCH SEVENTH FRAMEWORK PROGRAMME 2007-2013 Mark Stroud Home Office Scientific Development Branch UK Security Programme Committee Member." 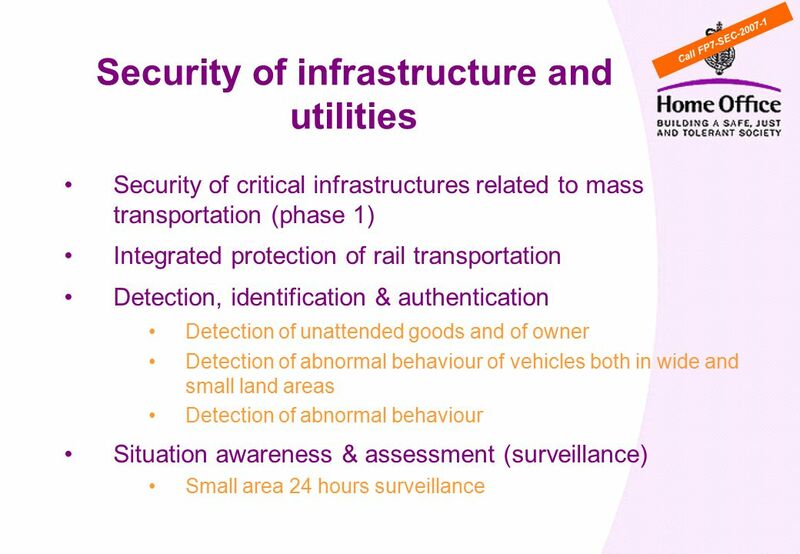 Critical Infrastructure Protection Policy Priorities Sara Pinheiro European Commission DG Home Affairs. 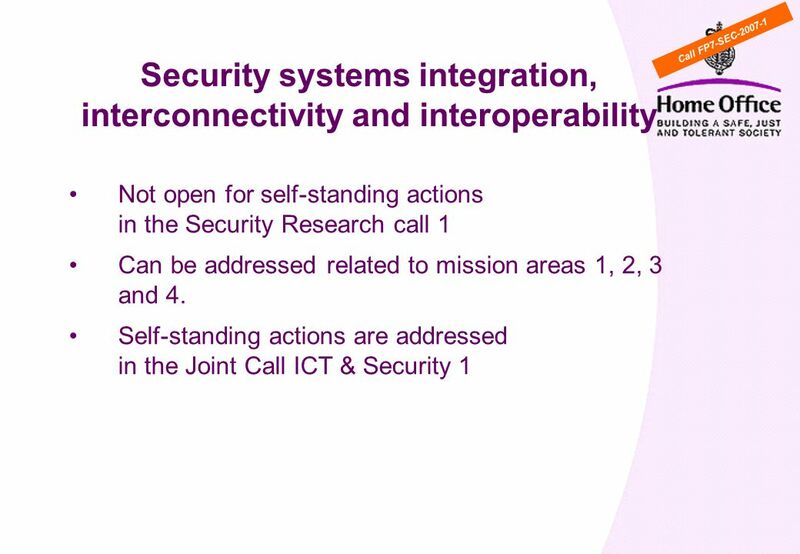 G.W ICT for risk management FP6 Strategic Objective ICT for Environment Information Society & Media DG European Commission, Brussels Guy Weets Deputy. 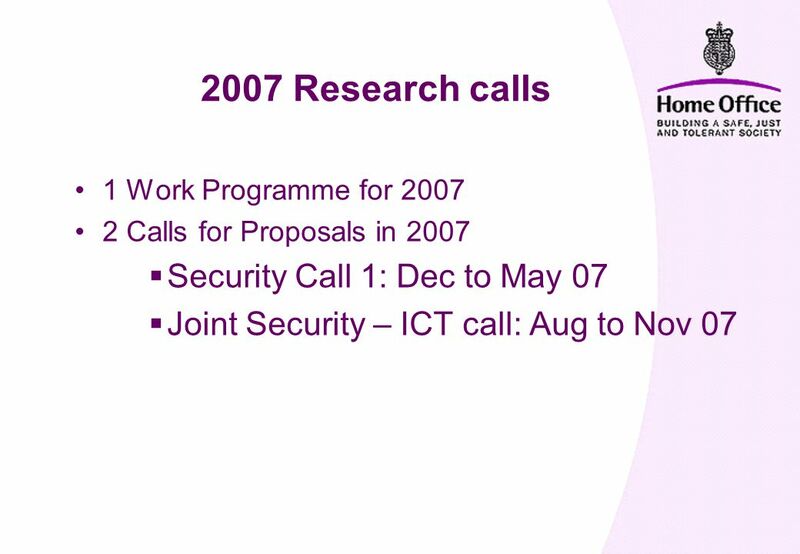 Work programme 2009 – Info Day European Commission – DG Enterprise & Industry E-M. Engdahl Information Day 16th September 2009 Brussels Kristien Van Goey. 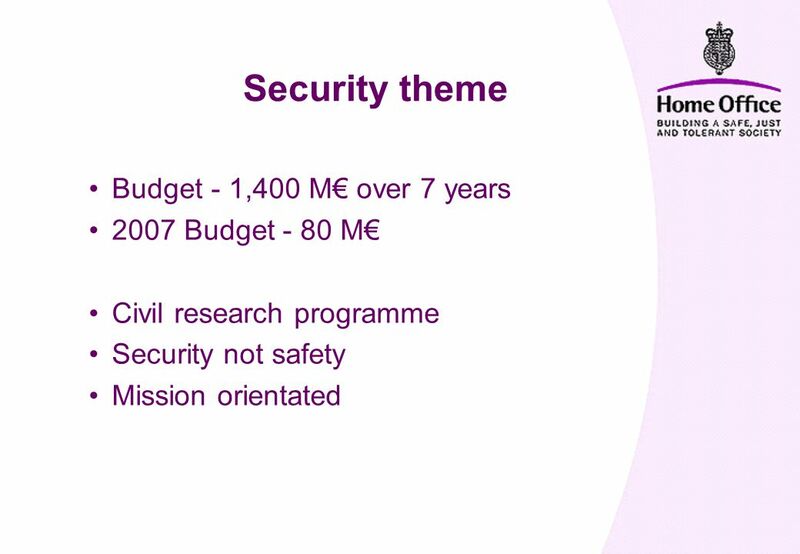 All together in a safe couch Press briefing on the Mass transportation security demonstration programme Prague May 2009 Dr E. Anders Eriksson, FOI DEMASST. 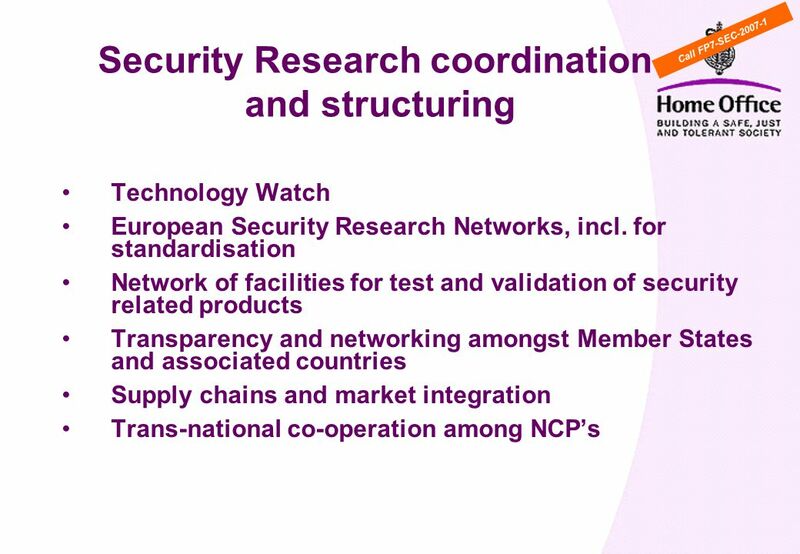 The evolution of European security research and innovation programmes: changing purposes and rationales Jean-Marc Suchier ETTIS R&I strategies and policy. 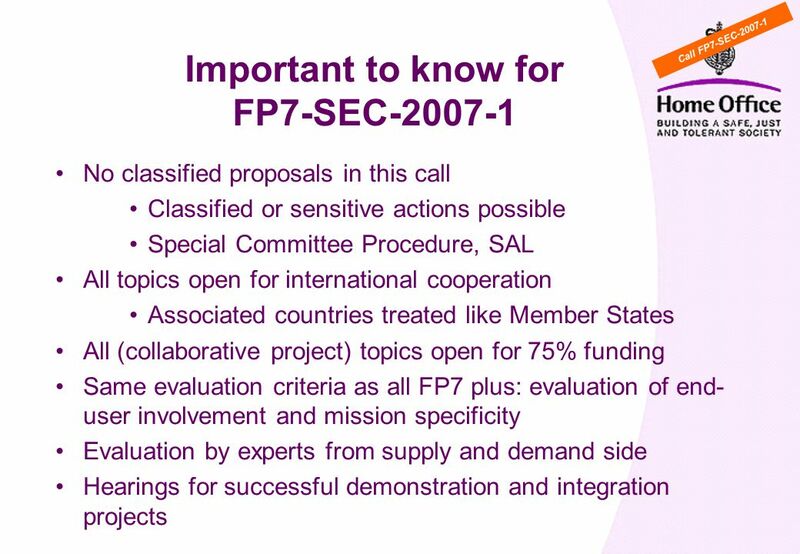 1 Moderated by Gordon Gillerman National Institute of Standards & Technology November 10, 2010 Ninth Annual ANSI-HSSP Plenary: U.S. European Collaboration. 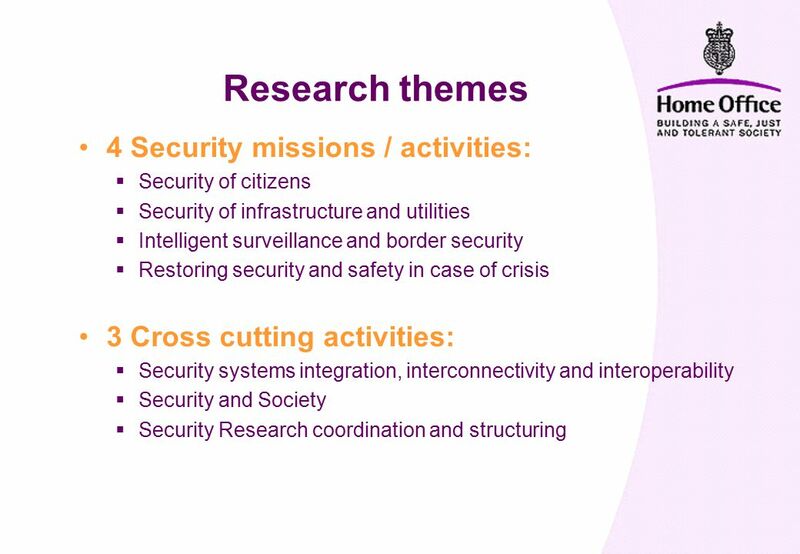 Experts workshop on Maritime Security: Addis Ababa EXPERTS WORKSHOP ON MARITIME SECURITY Addis Ababa, 6-7 April-2010. 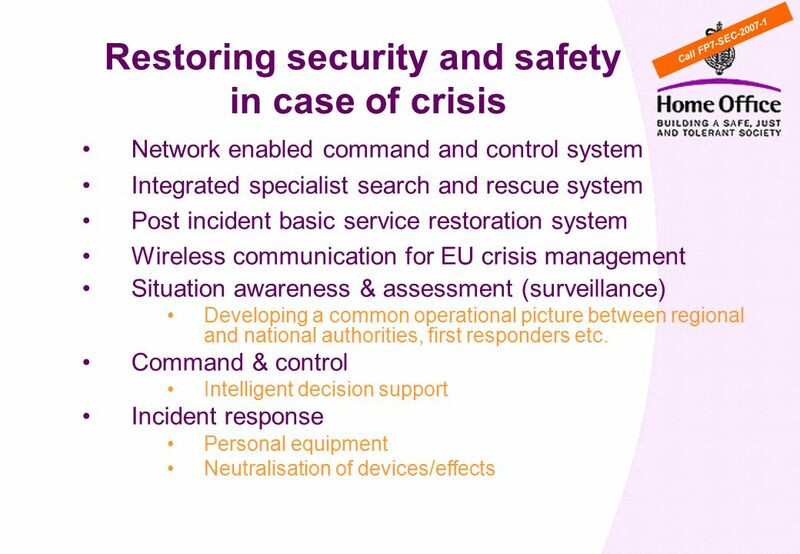 IMGS TA4 – Protection Neutralisation and Restoration.